The Penguins drew first blood. Patric Hornqvist’s first career playoff hat trick highlighted a Pens’ 5-2 win over the Rangers taking Game One. Despite getting outplayed early, Pittsburgh took advantage of awful breakdowns from the Rangers. 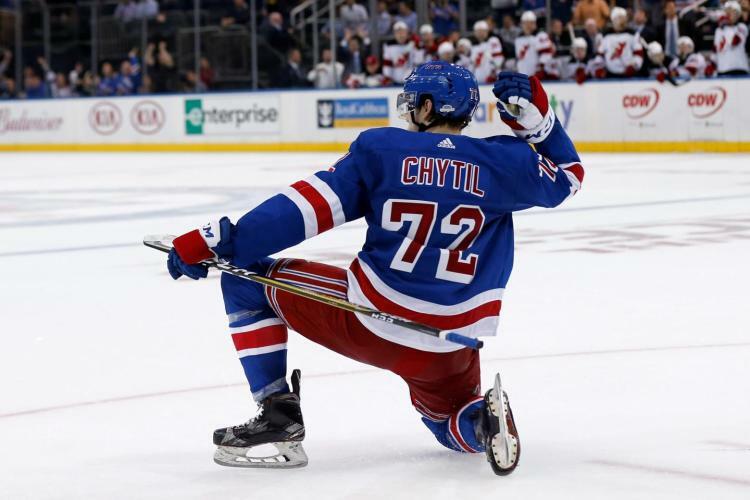 Much like their inconsistent season that had people concerned entering the playoffs, the Rangers made some critical mistakes in a three-goal road defeat to fall behind 1-0 in the best-of-seven first round series. Between coverage issues and undisciplined penalties, they weren’t good enough to beat a Pens team who got a big 35-save effort from third string goalie Jeff Zatkoff, who won his NHL playoff debut. Early on, Zatkoff was the difference, fending off multiple Rangers’ chances. Indeed, they got off to a good start testing the 28-year old surprise starter several times. The Rangers were the superior team for a majority of the first period. Despite some good sustained pressure and at one point an 11-3 lead in shots, they were unable to beat Zatkoff. They either fired shots into him like Marc Staal did or had them blocked or go wide. Coached by former John Tortorella assistant Mike Sullivan, the Pens played a combination of the 2012 Rangers’ defensive style with current coach Alain Vigneault’s offensive style emphasizing their team speed. It translated into 41 Ranger shots never making it to Zatkoff. As a team, the Pens blocked 22 shots. The Rangers only had 10. They also missed 19 more shot attempts. They out-attempted the Pens 78-56. The trouble was they didn’t get to Zatkoff early. That’s the key whenever you face a goalie who hadn’t started since Feb. 20. In fact, it was only his Zatkoff’s sixth appearance since January. He didn’t look fazed. Even with the Rangers applying early pressure off a good fore-check, he made the saves and his teammates cleared the rebounds. When they weren’t busy collapsing around him, they didn’t allow the Rangers to get inside position. Something that must change if they’re to get a split in Game Two on Saturday. A turning point came on their first power play. Following a couple of questionable calls on Viktor Stalberg which they killed off, they benefited from another perplexing call on Eric Fehr for a skate shower on Henrik Lundqvist. The execution on the power play was awful. They had no puck possession and turned pucks over eventually leading to a Carl Hagelin shorthanded chance with his tip of a Kris Letang pass going off Lundqvist’s stick and wide. Following the successful kill, the Pens took over. They out-shot the Rangers 8-1 the rest of the period. Lundqvist didn’t have to make a lot of saves but got a piece of a tough Trevor Daley point chance off a smart pinch. He also kicked out a couple of other Pens’ opportunities. Unfortunately, he didn’t finish the game. In a very scary moment, Lundqvist took an accidental stick from Staal while making a stop. Clearly in pain, he was attended to by Rangers trainer Jim Ramsay. After a lengthy delay at the bench for repairs which led to ridiculous boos from a CONSOL Energy sellout crowd, he returned. His teammates forgot to. Their lack of attention to detail proved costly when Hornqvist got the first of his three goals with 18 seconds left. It was another late goal that could’ve been prevented. Rookie Connor Sheary made the play possible with his speed firing a sharp angle shot that Lundqvist sticked out to Hornqvist as three Rangers stood around and watched. Staal didn’t take Hornqvist. It was part of a nightmarish game for the Rangers’ alternate captain, finishing minus-two in 28 shifts (20:43). He was far from the only guilty party. There were too many passengers. Trailing by a goal after one, Lundqvist didn’t return for the second. Updating his status, Vigneault said he’s day-to-day. If it’s his eye, who knows if he is in for Game 2. The extra day of rest should help. Called into duty, backup Antti Raanta made his playoff debut. He was okay allowing three goals on 20 shots. He wasn’t the problem. It was the Rangers’ sloppiness which proved fatal. In a similar second that was played more in their favor, the Rangers still were unable to get a puck past Zatkoff. They also had trouble getting pucks through from primary areas. Credit must be given to the Pens’ structure which was superb. They sacrificed their bodies and got in the path of Ranger shots and passes, making it difficult. The Rangers’ best chance was on a much better power play halfway through. Despite good possession and full control against a tough Pens’ kill, they didn’t convert. Whenever the Pens’ speed came into play, they got dangerous chances forcing Raanta to make some tough stops. Another crucial mistake cost them another goal against. Dan Girardi was victimized on Sidney Crosby’s first when he converted a breakaway on a great feed from Hornqvist. Girardi had a point shot blocked. He and partner Staal never recovered, allowing Crosby to sneak behind and break in and go top shelf on Raanta for a 2-0 Pens’ lead with 1:04 left in the period. Another back breaking late goal that has been a recurring theme all season. In the third, the Pens tried their best to get the Rangers back in the game. A Hagelin errant stick bloodied Kevin Hayes causing a double minor. On the same play, Ian Cole was penalized for taking down Eric Staal which gave the Rangers a full two-minute two-man advantage. Thanks to some patience from a well shadowed Derick Brassard, he got the puck over to Rick Nash down low. Nash then came out and dished across for an open Derek Stepan, who buried his first of the postseason that cut it to 2-1 at 3:10 of the third. Still on the power play due to it being the second half of Hagelin’s high-sticking double minor, they had a golden opportunity to tie the game. Instead, following a good Zatkoff save, they fell apart in epic fashion. Letang caused a turnover at the Pittsburgh blue line, leading to a two-on-one on Keith Yandle. Yandle played it poorly not taking away the pass, allowing Nick Bonino to thread the needle across for Tom Kuhnhackl’s shorthanded goal coming at 5:31. The awful conclusion to the second part of a extended power play resulted in them still down by two. What a disaster. Still reeling, a Eric Staal goalie interference led directly to Hornqvist’s second on the power play which made it 4-1 with 11:58 left. A determined Crosby combined with Phil Kessel to set up Hornqvist in front. Crosby fired a low shot that caromed off Raanta to Kessel who was denied. But with no one able to front their man, Hornqvist pushed the puck across. It’s that kind of defense that’s resulted in such goals. Nobody ever clears the front. If only Vigneault rethinks keeping behemoth Dylan McIlrath in press row. Trailing by three, a rush started by Dan Boyle resulted in Stepan’s second of the game. With Zuccarello moved to his line, Stepan took a Zuccarello drop and went high, short side on Zatkoff to cut the deficit to 4-2 with still 9:49 remaining. After finally doing a better job getting chances by firing 15 shots on the Pens’ netminder. With still enough time left to cut it to a goal, Vigneault made a questionable decision. He pulled Raanta with 2:54 remaining. I didn’t like it at the time because I felt he should’ve waited longer. There was still time to try to get it to 4-3. Instead, the quick trigger backfired with Hornqvist taking a pass from Crosby for the empty netter with 2:50 left. Four seconds expired after Vigneault’s goalie pull. It was a perplexing move that I questioned. Onto Game 2. Notes: In his first NHL postseason game, rookie Brady Skjei was a bright spot defensively. The 22-year old defenseman took 25 shifts logging 17:08 with one shot and five hits including a clean cruncher on Crosby against the glass which the Pens captain whined about. His complaint resulted in a odd Stalberg penalty for illegal check to the head that came a split second late. It was high but I’m unsure it merited a penalty. I’d prefer the refs let them play. … Each team went 1-for-5 on their power play. However, the shorthanded goal allowed to Kuhnhackle was a crusher which killed their momentum. … The Pens dressed seven defensemen including Olli Maatta, who was solid in his return taking 19 shifts (14:29) and going plus-one. Justin Schultz logged 11 shifts (5:52). … The teams held a moment of silence for former Flyers chairman and CEO Ed Snider. He passed away at the age of 83 on Monday due to bladder cancer. … Game 2 is Saturday afternoon at 3 EST on NBC. This entry was posted in NHL Playoffs, NYRangers and tagged Antti Raanta, Carl Hagelin, Dan Boyle, Dan Girardi, Derek Stepan, Derick Brassard, first round, Game 1, Henrik Lundqvist, Jeff Zatkoff, Keith Yandle, Kris Letang, Marc Staal, Mats Zuccarello, NHL Playoffs, Patric Hornqvist, Pens, Rangers, Rick Nash, Sidney Crosby, Tom Kuhnhackl. Bookmark the permalink.